Batman â The Dark Knight â Sticker Activity Book. 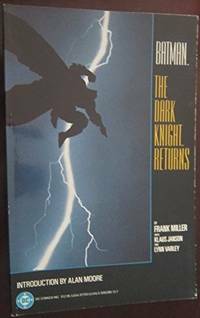 Batman â The Dark Knight â Batmanâs Friends and Foes: I Can Read! : v. 1. Batman â The Dark Knight â Activity Book. Batman: Gotham City Limits - Colouring Book. (MEI GUO) FU LAN KE MI LE JIANG YE HUA YI. Batman: the first year(Chinese Edition). Barr, Mike W. Batman: Full Circle. We can help you find the batman books you are looking for. As the world's largest independent marketplace for new, used and rare books, you always get the best in service and value when you buy from Biblio.com, and all of your purchases are backed by our return guarantee. Frank Miller began his career in comics in the late 1970s and rose to fame while first drawing, and then writing, Daredevil for Marvel Comics. He was also the creative force behind Batman: The Dark Knight Returns , Batman: Year One , and Batman: The Dark Knight Strikes Again . His many works have not only redefined classic characters, but also, on a few occasions, revitalized the comics industry. His creator-owned Sin City hit the page in 1991, and then the silver screen in 2005 — with Miller on board as co-director. His multi-award-winning 300 graphic novel was brought to full-blooded life in the 2007 motion picture of the same name, and in 2008 he directed the feature film of Will Eisner’s The Spirit . David Mazzucchelli drew his first professional comic book while majoring in painting at the Rhode Island School of Design. After a handful of jobs for Marvel and DC Comics, he became the regular artist on Marvel’s Daredevil , where he first collaborated with writer Frank Miller to produce the highly successful and critically acclaimed seven-part story “Born Again.” David’s most recent project is the self-published Rubber Blanket . His work on BATMAN and Daredevil has earned him both an American Comic Book Award and Spain’s Haxtur Prize. In 2009, Pantheon Books published Mazzucchelli's Asterios Polyp, which was met with critical acclaim. In 2010, Asterios Polyp won three Eisner Awards for Best Graphic Album–New, Best Writer/Artist, Best Lettering. Melbourne: Cassell Australia. 1965. Octavo Size [approx 15.5 x 22.8cm]. Very Good condition in Very Good Dustjacket. DJ protected in our purpose-made plastic sleeve. Some light tanning to page edges. Illustrated with colour and black & white plates. Foreword by General Sir Dallas Brooks. xiv, 178 pages . 1st Edition. Hardback. 2002-02-08. Good. Ships with Tracking Number! INTERNATIONAL WORLDWIDE Shipping available. May not contain Access Codes or Supplements. May be ex-library. Shipping & Handling by region. Buy with confidence, excellent customer service! Dc Comics. Very Good. 1992. Paperback. 1563890607 . This book is in very good condition; no remainder marks. It does have some cover shelfwear. Inside pages are clean. ; 0.3 x 10.7 x 7.9 Inches . paperback. New. Ship out in 2 business day, And Fast shipping, Free Tracking number will be provided after the shipment.Paperback Pages Number: 134 Batman: The first year is about a spoiled rich kid Bruce Wayne parents was killed by gangsters determined to eradicate the rampant crime and evil in Gotham City. the embodiment of the masked hero bat Man on a dark street and evil in the story of the arduous struggle. This comic about the most famous superheroes - Batman debut story. such as the Gordon police officer. prosecutor Harvey. Catwoman and other roles in this one ...... is on the Batman series The play beg... Satisfaction guaranteed,or money back. 1998-04-02. Good. Ships with Tracking Number! INTERNATIONAL WORLDWIDE Shipping available. May not contain Access Codes or Supplements. May be ex-library. Shipping & Handling by region. Buy with confidence, excellent customer service! Insight Editions, 2012. Hardcover. Acceptable. Disclaimer:A readable copy. All pages are intact, and the cover is intact. Pages can include considerable notes-in pen or highlighter-but the notes cannot obscure the text. At ThriftBooks, our motto is: Read More, Spend Less.Dust jacket quality is not guaranteed. Warner Bros, 1997. VG/na. Softcover. Song/music book. Light rubbing & edgewear; overall, clean & tight copy. New York, NY: DC Comics, 1990. First edition / first printing (10 9 8 7 6 5 4 3 2 1). Book is in fine condition with a fine unclipped dustjacket protected in a Brodart wrapper. An Attractive Copy! Please feel free to ask me for pictures or more information, Thanks. . First Edition. Hard Cover. Like New/Like New. Illus. by Tom Grindberg.